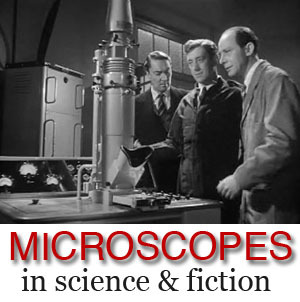 This article about state of the art microscopes is part of the Science in Sci-fi, Fact in Fantasy blog series. Each week, we tackle one of the scientific or technological concepts pervasive in sci-fi (space travel, genetic engineering, artificial intelligence, etc.) with input from an expert. Terry Newman is a former electron microscopist and now writes for film, TV, stage, radio and print. His bestselling comic fantasy Detective Strongoak and the Case of the Dead Elf was published by Harper Collins, and features the dwarf Master Detective Nicely Strongoak. You should follow him on Twitter. Electron microscopes are great, aren’t they? Electron microscopes are so much the future! You know them. You see them in the science documentaries, looking cool – sometimes because they are actually cooled by liquid nitrogen. They’re massive – some as big as two floors – with loads of lights and switches! And they use enormous voltages to look at really small things. I mean really small; you can even move atoms about with them. Admittedly somebody did make a desktop scanning electron microscope (SEM), but it never really caught on, because it wasn’t big enough! SEMs are actually pretty cool though as you get fantastic 3-D pictures, and in COLOUR! Well, if you add it yourself (mostly) in some way. 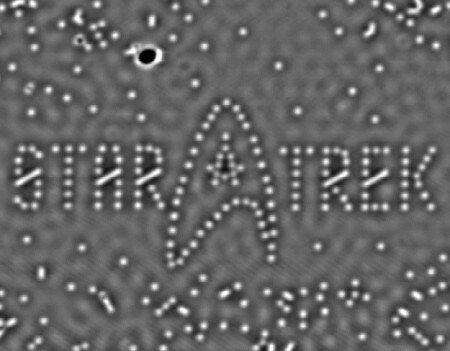 And electron microscopes already appear in science fiction as well. That’s cool! TV shows are particularly fond of having an electron microscope or two in the lab. On ‘Big Bang Theory’ recently (the episode where the pigeon gets into the lab clean room on Christmas Eve – brilliant!) I saw a Zeiss ‘Red’ CEM 902 i. You know the one? It’s big with a vacuum column that is painted err red. They mostly have an impressive vacuum column – even if it’s not red it’ll be shiny! Conventional transmission electron microscopes (TEMs) are a bit dull in operation though, because you usually don’t have a handy TV screen to manipulate or talk to Deckard-like. Normally it’s a florescent screen that you really need to look at in the dark, which doesn’t make for such good TV. And usually, at least if it’s biology, you look at an ultrathin section of something, which is hard to make out and even fewer viewers are interested in looking at graphs produced from elemental analysis of whatever you have in your column. The micrographs can look pretty good though, except then you aren’t actually looking at something under that big shiny column with all the lights. Techniques such as freeze-fraction replication can give you incredible detail with images looking like moonscapes! And by using liquid helium to cool biological tissues you can even begin to get a real insight into dynamic cellular activities at the nanoscale. Activities such as muscle contraction can, literally, be caught in the act, but again you really need to look at the micrograph, and that’s just not SF enough. You could be looking at a series of very exotic holiday snaps. Authenticity doesn’t seem to matter too much for film or TV. In one American show, I saw somebody take off the glass window the front of the supposedly ‘vacuum’ column of a transmission electron microscope and put the specimen in through the hole. They looked at the result on a SEM’s monitor screen. Oh how all us microscopists laughed! They are so much the future, electron microscopes! They even sound futuristic. Except the first one that I ever saw (on the screen at least) was in a film from 1951. ‘The Man in the White Suit’ (see the header image) starred Alex Guinness – Obi Wan Kenobi to you – and it had a real functional TEM on screen, as far as I could tell anyway. I worked at a university that still had one just like it and they kept it in operation in case this famous elderly scientist dropped by to do some science. As you do. This was created by those clever scientists at IBM by manipulating atoms. The whole nanotechnology explosion necessitates the use of some very expensive electron microscopes. At right is an image of an individual protein molecule at the nanoscale that I ‘snapped’ some time ago. That’s pretty nano. Nice isn’t it? So let’s hear it for electron microscopes – in the future every space ship should have a few for looking at how those aliens function with their strange fish-like scales. Heck, I even had a job once which was all about preparing biological specimens in space for electron microscopy. It’s very sad for this (ex) electron microscopist to relate, but the development of fluorescent labelling techniques and the explosion of so many sophisticated light microscope techniques now makes light microscopes (once again) the techniques of choice for studying dynamic processes in living cells. Laser-scanning confocal microscopy, total internal reflection fluorescence microscopy, light sheet microscopy, superresolution microscopy, – the developments in light microscopy just won’t stop coming! Which is all very well, and the results are great, and you can have some impressive fluorescent colours involved, but it somehow just isn’t the same to me. I mean they haven’t got electron in the name have they and that was always going to be the future. Mind you, two-photon excitation light microscopy – that sounds pretty cool too, now I come to think about it.